On Thursday night, the temperature plunged to -2 degrees; not to be deterred, Melissa Etheridge’s loyal fans trudged out to the Ordway Center for the Performing Arts in St. Paul to see her. They were rewarded by a performance with Etheridge’s trademark raspy voice in top form as she belted out her numerous compositions as well as covers of rock/blues/soul classics from her new album Memphis Rock and Soul. From a polling of the audience, many (including myself) were seeing her for the umpteenth time and were rewarded by a talkative Etheridge who played many of her fans’ favorites. Read Ali O’Reilly’s review of the same concert. Etheridge writes most of her own material and has a unique lyric style that creates music that only her voice can do justice to. Referring to herself as a lyricist rather than a poet, Etheridge typically pens songs that revolve around relationships from start to end. Indeed, many focus specifically on relationships’ end and aftermath. Her long discography includes 14 studio albums; however, her concert on Thursday primarily focused on songs from her first six albums. Etheridge is a talented guitarist frequently demonstrating her intricate guitar work and, at one point, played an 18 string guitar. Her most upbeat song was the joyful “I Want to Be in Love” from her Skin album. Intermixed with her fan favorites were covers of the rock/blues classics including “Respect Yourself,” and “Rock Me Baby” from her latest album. 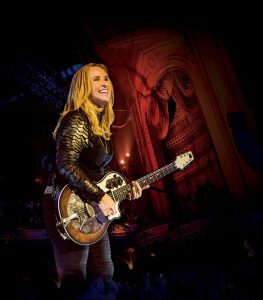 She also played many songs from her debut album Melissa Etheridge, however, including “Similar Features,” “Like the Way I Do” and the crowd-pleasing version of “Bring Me Some Water,” where Etheridge displayed her drum-playing skills in a drum duet. To play all of my favorites, Etheridge would need to perform a 5-hour concert. But after a strong 2-hour set, her fans left the concert very satisfied and a little warmer.